Extend the growing power of Magic Manure by brewing your own liquid fertiliser. 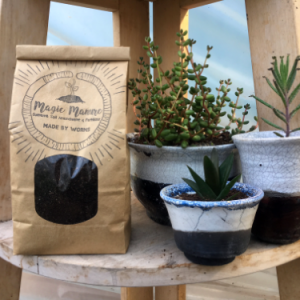 The perfect gift for the conscious gardener. Brew your own liquid fertiliser and foliar spray to keep your plants thriving and resistant to pests and disease. Each box contains 8 brew bags of pure worm manure and each bag makes up to 6 litres of fertiliser. After use scatter contents around the base of a plant or mix with compost. 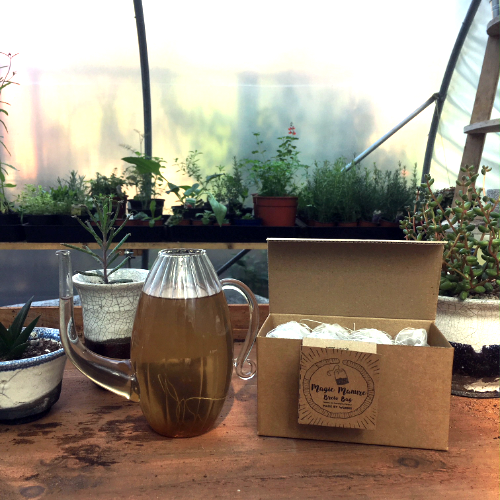 100 % biodegradable brew bags made from corn starch. The only fresh manure not to scorch plants. Seeds can be sown direct in 100% worm manure. Teeming with minerals and nutrients essential for the development of strong cell walls. Concentrated nutrient base that slow releases as and when required by the plant. Holds up to 50% moisture, building resilience against drought and heavy rainfall as a consequence of climate change. Contains auxins and cytokinins, growth hormones promoting fibrous roots healthy plant development. One tablespoon provides enough nutrients for a plant to thrive throughout the growing season. Contains fungus eating nematodes and protozoa. Contains high levels of chitinase a natural insect repellent. Cylindrical shape prevents compaction, aiding drainage and root development.